If there's a word that would describe the world of Transistor better than any other it would be unique, even in the market of futuristic cyberpunk inspired stories, Transistor manages to shine by introducing you to its world and then gradually allowing you to discover it at your own pace, without necessarily forcing the story bits on players who are here just for the gameplay, but leaving plenty of opportunities to those who are keen to discover more of the world and the cast of characters that make Transistor such a memorable experience. You play as Red, a night singer in one of Cloudbank city's most popular locals after the event of the Process, a robotic force, being unleashed on the city by a group called Camerata, which serve as the overseers of the city. Finding herself without a voice, she sets foot to find out what happened, moment when she bumps into the Transistor, a sword now infused with the soul of Red's love interest which gives her the power to stop time and reflect on the world and the combat from a still point of view, allowing you to plan your next move carefully and trying different combinations of functions before deciding which fits the situation best and restarting the normal flow of time. Even if the story can be understood just by following the normal path, numerous terminals found throughout the city can provide additional information and allow Red to communicate with the Camerata, leave comments on public posts or even reply back to the Transistor via writing since she can't speak. The unique twist with Transistor's gameplay comes with the ability to stop time, resulting in a semi turn based combat mechanic that only applies to your side, eliminating the boring process of waiting for the enemies to execute their turn and always keeping you on the move, as Red can use any function even when time isn't stopped, but since most enemies are faster than you and sometimes avoiding attacks in real time is literally impossible, the time stop ability becomes your best friend and a mandatory tool to success. There are over a dozen different functions, all of which can be used either as an active skill, an upgrade to another function or a passive skill, encouraging you to experiment with different combinations and find a build that works for you and your play style, from functions that deal damage in a line, to AOE functions, buffs and passive functions that can have surprising outcomes such as the Help function which when assigned to the passive slot will give you a 25% to trigger SuperUser mode when you're stopping time, replacing all your functions with one blast dealing super function for that one turn. There are hundreds of different combinations you can try out, and one of the greatest things about Transistor is finding out what each combination does on your own, because the game's punishment system for death is just as interesting: instead of killing you off when your HP reaches zero, Transistor will instead remove an active function out of the 4 maximum each time you die, so you will have one function less, but respawn back to maximum health and so on until you lose all the functions. Lost functions have a cooldown period, so you are highly encouraged to replace them with others, giving you the chance to try out different combinations, but also giving you a fighting chance even when your go-to skill is unavailable. On top of that for players seeking more challenge you have the limiters, which will trigger different penalties such as more bad cells spawning from dead enemies or less available memory, the catch here is that you will be awarded more experience for completing encounters while having limiters in use, so if you are down for it and want to level up faster or just want an extra layer of challenge, Transistor has got you covered. Transistor's art style is yet another triumph for the game, as the hand drawn environments bring the city of Cloudbank to life, making each location feel distinct and unique, which also helps since getting lost is usually a major problem in top-down camera games such as this, but since each corner has a landmark that you'll remember, it's easy to always know which way you came from, which way you're supposed to go and explore anything else you find in between. Instead of those action packed cutscenes that you seem to see everywhere nowadays, Transistor fills in the blanks between one gameplay section and the next one with calm and intriguing moments of landscape beauty. Instead of looking at a loading screen for two minutes, you get to see Red riding a motorcycle with the Cloudcity buildings illuminating the background as she makes her way to the next section, something that I wish more games would do to replace traditional boring loading screens. Probably one of the most popular aspects of this game is the soundtrack, and for good reason, this mix of techno ambient tracks always seems on point with the action on screen, as even when the gameplay takes a pause to exploration, the soundtrack goes along with it. There are numerous great tracks even by themselves, but when used in the right place in the game, that's when their magic goes into full effect. 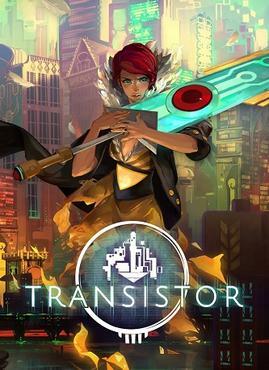 The voice acting, although limited to the Transistor and a few side characters is just as good, and the dialogue is paced in just the right amount, without dragging you on for too long from the action, but also providing a more wide view of the world for those interested in the story. The campaign can be completed in 6-7 hours, but since you will only reach around half of the maximum level, replaying the game is highly encouraged as you can unlock new functions and limiters, try out the ones you have unlocked already in new ways and try your hand against tougher enemies with more limiters in use. On top of that there are numerous side tests that will be unlocked as you naturally progress through the campaign, which can keep you busy for an additional 2-3 hours. Transistor is a marvelous achievement in its genre and an incredible adventure for anyone looking for something new; if tags like turn based combat might turn you away from this game I highly recommend to reconsider, because unlike other RPGs, Transistor is rather simple to learn, but leaving plenty of room for experimentation and improvement.